Margaret Fontana and sister, Meri Scals. Meri Scals has spent years as a top stylist, including many as a platform artist, educator and salon owner. When she became a mother, she struggled to find the time to take care of herself while she was taking care of everyone else and running her salon. She realized there were few beauty resources for pregnant women and mothers. "Sometimes getting in the shower and doing your own hair can prove to be the hardest task of all when you're a mom," Scals says. Out of this frustration, a business was born. The New Jersey entrepreneur paired her years as a stylist with her experience and knowledge of being a mother to create Maternity Salon — a web site where women could find simple, easy advice on hair color, styles and beauty products from a veteran of the beauty industry. "If you look good, you will feel good," Scals says. The site includes articles targeted toward expectant moms as well as new moms, such as "Desperate to Get out of the House?," "Anxiety and Pregnancy" and "What to bring to the Hospital." 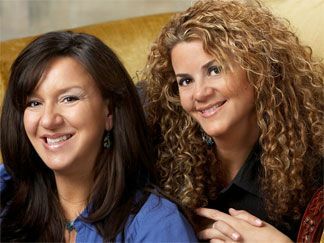 Along with the site, she worked with her sister and business partner, Margaret Fontana, to create a line of professional salon hair products for expectant and new mothers. The product line is made with certified botanical plant extracts, which help soothe, repair and condition hair. The products all are packaged in 100% recycled bottles. Scals, who has thick, curly hair, wanted the products to be able to manage all types of hair, including hers. The collection includes Curly Creme, a moisture-enriched creme that increases curl and wave definition; Silk Nectar, which smooths and defrizzes curls; Work & Play Spray, a humidity-resistant spray; and Style Straight, a botanically rich leave-in conditioner and softening balm that can controls curls. "It's extremely hard to find a great hair product to manage thick, curly and sometimes dry curly hair," says Fontana, who also has tight curls. "These products are a dream come true for my hair. These professional salon products give you great separated curls, frizz-free and healthy hair." Do you have dry patches, rashes, acne or skin discolorations that you never had before? Well, welcome to the maternity skin roller coaster. From the infamous "glow" of pregnancy to the "mask" of pregnancy. Skin goes through an array of hormonal changes during your 9-month journey. Here are some great tips for mommy friendly skin care during pregnancy. Opt for gentle, hypo-allergenic products that are non-abrasive and mild or odorless. Many regular skin care products may have strong scents or fragrances that can be nauseating during pregnancy. A professional facial may sound like a great idea, but here's my opinion why you may want to avoid a spa facial during pregnancy. Professional facial products used in a skincare salon vary greatly, many contain an array of ingredients and different acids which may be very irritating to your skin while pregnant. Many professional facial masks, massage creams and treatments are highly fragranced and sometimes the smell can be hard to take. Laying on your back during the second or third trimester is not only uncomfortable but may restrict blood flow, especially when it should be a relaxing experience, a facial is not on my top list of things to do. Opt for a mini-facial where you can sit upright and still enjoy yourself. Avoid harsh alphahydroxy peels microderm abrasion, chemical peels, steroidal creams and potent chemical anti-wrinkle potions. All chemicals can and may be absorbed into the skin. Gentle, simple, clean skin care is the way to go during pregnancy.